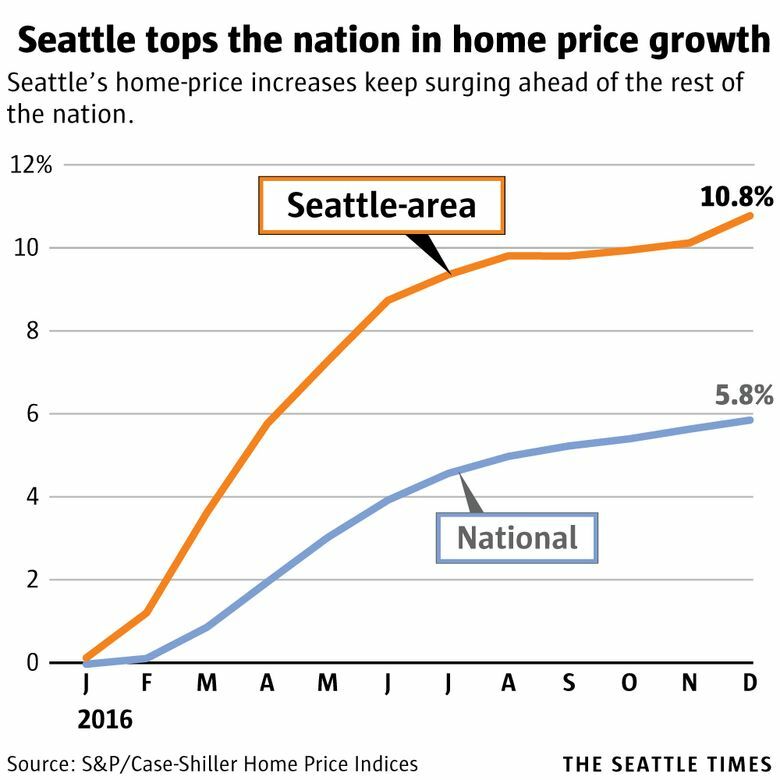 Greater Seattle once again had the biggest home-price increase in the nation, with home values soaring at nearly twice the national rate. Big housing-cost increases are taking a heavy toll on millennials throughout the Seattle area, which has retained its title as the hottest housing market in the country. A new poll from a local nonprofit finds that 45 percent of millennials in the Puget Sound region think they will have to move somewhere cheaper to afford the life they want, even though nearly all would prefer to stay in the area. Local young adults ranked housing costs as their biggest concern, beating out problems that older adults find more troubling, like traffic and homelessness (although older adults said housing costs were one of their most important issues, as well). It’s not hard to see why. Single-family-home prices across Greater Seattle grew 10.8 percent year over year in December, the most of any region in the country and nearly double the national growth of 5.8 percent, according to the monthly Case-Shiller home price index, released Tuesday. The Seattle region has beaten Portland for the top spot for four straight months and has finished among the two top housing markets in the country for a full year. And after local home-price increases had slowed for the past few months, they picked back up again slightly in December across King, Snohomish and Pierce counties. Compared to just a month earlier, home prices were up 0.6 percent, which may not sound like much, but it was triple the national average. This is normally the cheapest time of year for local real estate, but a record-low supply of homes has made this winter frustrating for buyers, with a median price of $635,000 for a house in Seattle. The home-price data comes as the new millennial survey shows how those added housing costs — including soaring rents — could be forcing out young adults here. King County alone has 400,000 millennials, among the highest concentrations of young adults in the United States. The poll was conducted by EMC Research for local environmental nonprofit Forterra, which advocates against sprawl, with funding help from Microsoft. Researchers talked to a representative sample of 300 young adults in King, Snohomish and Pierce counties late last summer, and supplemented the findings with a web poll of about 870 local millennials. The research found that 92 percent of local millennials, ages 18 to 35, were concerned about housing costs, with a little more than half saying they were “very concerned.” That beat out all the other topics raised, including traffic, crime, inequality, the environment, employment prospects and college costs. Researchers asked respondents whether they wanted to stay in the Puget Sound region for the long term, and 87 percent said yes. But when asked whether they could afford to live the life they wanted in their current community, only 54 percent said yes. Groups that were especially likely to say they might move include women, people in their late 20s and those with low incomes. The poll didn’t delve further into the question, so it’s unclear if those millennials were thinking about moving out of the area entirely, or if they simply thought they’d have to move to a cheaper part of the region. 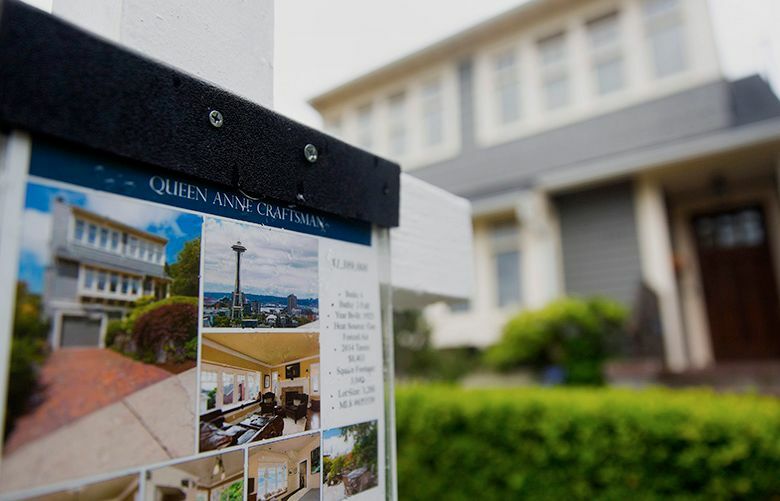 Plenty of prior generations have experienced the “drive until you qualify” phenomenon, where people extend their commutes to afford a home purchase, although outlying suburbs here are now seeing home prices rise faster than in Seattle. In all, local home prices and rents have soared more than 40 percent in the last four years, adding several hundred dollars a month onto housing bills. And the National Association of Realtors expects home costs to rise more in Washington than in any other state in 2017. Like many young Americans, Nicolette Bruer, 23, is dealing with crippling student debt — she graduated owing $100,000 and is now dealing with a rent increase at her shared Capitol Hill apartment while trying to get by on an entry-level job. Although some are moving out of the region entirely, others are settling on more affordable places nearby, like in Snohomish and Pierce counties, and traveling an hour or more into work each day. Sarah Farahani, 30, moved to Tacoma after getting a huge rent increase and now commutes to her public-transit job in Seattle. Lainey Piland, 31, grew up in Redmond and Monroe and had to move out to Lake Stevens with her husband to afford a house. Now she’s dealing with a “terrible” commute. “I never thought I wouldn’t be able to afford to buy a house in the town where I grew up,” said Piland. Of course, plenty of millennials are making it work. 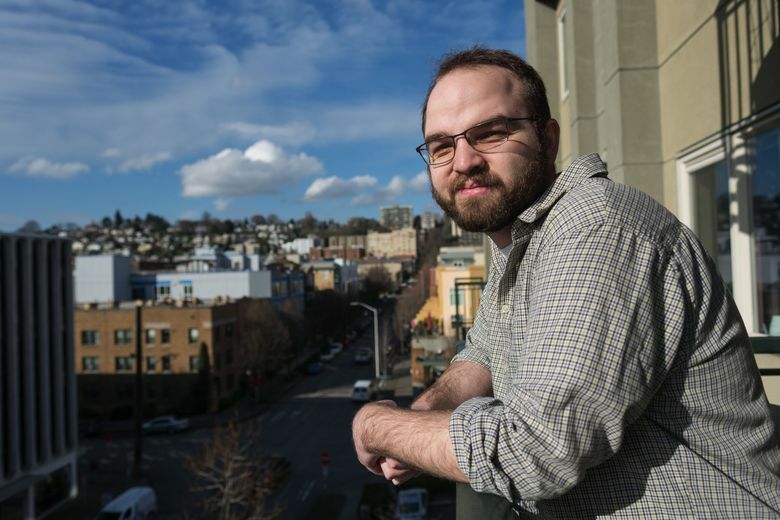 Brian Kostol, 27, rents with his girlfriend near Green Lake and has scrimped with lower-tier apartments to save up for a home. They think they can make a mortgage work by combining incomes. Although the size of homes is expanding nationwide, local millennials aren’t looking for huge houses. Asked about the type of housing they want in the poll, they ranked “having a large house” as the lowest priority, even behind having space to garden. Their top priority was living near parks and open space, and they also strongly want to live near work and transit — much more so than adults nationwide — and to be close to good schools. About 63 percent in the survey supported rent control, and only 25 percent did not. Seattle has weighed enacting rent control, and the issue could resurface with the proposed renters’ commission, but the state has banned rent control. Lastly, researchers asked about the local construction boom. Seattle residents were split on the pace of growth, but the vast majority of those in the suburbs thought development should slow down.